Frank Pinzone contracted a bacterial infection at the age of two. 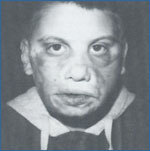 It resulted in the loss of skin on his face, partial loss of his intestines and the amputation of both his legs. He has undergone numerous skin grafting procedures on his face and body as well as physical therapy to help in his rehabilitation. When Frank was ten years old, the Hope For Tomorrow Foundation raised funds to help the Amherst, New York boy. In 1995 and 1996, plastic surgeon Dr. Jeffrey Meilman donated his services at Kenmore Mercy Hospital, near Buffalo, New York in an effort to improve Frank's facial appearance and to raise his self esteem to some degree as he entered his teenage years.